Financial terms were not disclosed and it's unclear what the combined company will be called. The combined company's name and marketing brands will be determined following regulatory approval, the companies said. Rival online takeout services Seamless North America and GrubHub on Monday announced plans to combine and create a new company covering more than 20,000 restaurants in 500 cities across the U.S.
Financial terms were not disclosed and it's unclear what the combined company will be called. GrubHub CEO Matt Maloney will become CEO, while Seamless CEO Jonathan Zabusky will serve as president, the companies said in a joint statement. Brian McAndrews, an independent director on the Seamless board, will serve as chairman. 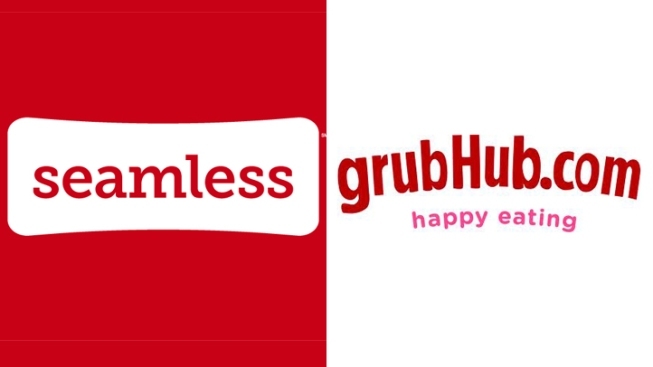 Both New York-based Seamless and Chicago-based GrubHub will have significant representation on the new company's board. Online takeout ordering services work by contracting with restaurants, mostly in large metropolitan areas, to list themselves on the websites. Diners can search the menus, along with reviews posted by diners, to find the food they want and then order and pay online. In addition to websites, both companies also offer smartphone apps geared toward diners on the go. "We are excited to combine the strengths of these two dynamic organizations in an industry that is rapidly gaining traction," Maloney said in a statement. "We believe the merger will enhance the products we are able to offer both our diners and restaurants." Maloney, who co-founded GrubHub Inc. in 2004, said that by combining their complementary restaurant and diner networks the new company will be well positioned for continued growth in what's become a huge market. The services appeal to diners by eliminating the need for a kitchen drawer of takeout menus, while also helping them discover new pickup and delivery options in their neighborhoods. Meanwhile, restaurants can benefit from new business and don't have to deal with as many phone orders, which can be labor intensive and prone to error. Last year, orders through the two privately held companies totaled about $875 million in gross food sales, resulting in combined revenue of more than $100 million. They also aggressively vied with each other for market share, boosting their ranks of sales representatives and heavily promoting themselves through social media and email offers and discounts. The combination of the two should simplify online ordering for both consumers and restaurants, many of whom currently split their online business between not just Seamless and GrubHub, but other similar services as well. Seamless North America LLC was spun off from Aramark Corp. last fall. Before that, Spectrum Equity Investors bought a minority stake in the company for $50 million. Seamless covers about 12,000 restaurants in 40 cities, mostly on the East and West Coasts, along with Houston and Austin, Texas, and overseas in London. GrubHub's ordering services cover 20,000 restaurants in about 500 cities. Since its inception, the company, which also owns Allmenus.com, has received about $84 million in funding. In addition to Seamless and GrubHub, other similar services have popped up in recent years. Delivery.com, founded in 2004, lets users order from nearly 10,000 restaurants in 50 cities, while California-based Eat24.com, founded in 2008, covers 20,000 restaurants in 1,000 cities across the country. Online deals site LivingSocial also launched a similar service late last year.